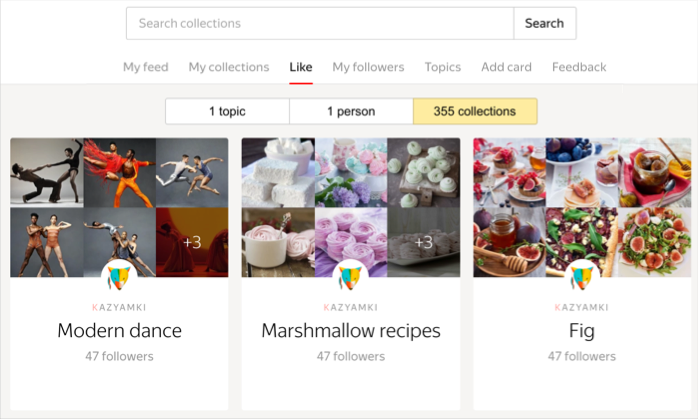 If you want to regularly receive new ideas for things such as dinner recipes, you can subscribe to topics or to users with interesting collections, as well as to specific collections. All new cards from these collections will appear in your Feed. To do this, simply click Subscribe on the page of the particular topic, user or collection. Note. When you subscribe to a user, all of their collections are automatically added to your subscriptions. You can unsubscribe from each collection separately. To view your subscriptions, click My likes in the top menu.